Giuseppe Verdi: Scenes from "Macbeth"
Emil Reznicek: Overture "Donna Diana"
Giacomo Puccini: Intermezzo from "Manon Lescaut"
Wolfgang Mozart: Overture "La Clemenza di Tito"
Introduction to Act 3 from "Tannhäuser"
Entrance of the Gods from "Das Rheingold"
Piotr Ilyitch Tchaikovsky: Waltz & Polonaise "Eugene Onegin"
Sir Thomas loved conducting operas and this collection demonstrates his innate abilities for stage drama. The 1947 Smetana items are full of infectious drive although Kubelík (recently reissued on Testament) is still unsurpassed here. The participation of the legendary Margherita Grandi is an added bonus in the 'Macbeth' items with an especially haunting 'Gran scena del Sonnambulismo'. 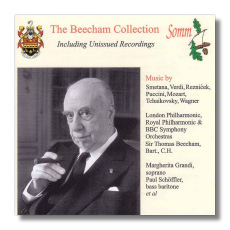 Dutton already has the 'Donna Dian' overture on their Concert Classics disc but this remastering by Somm I s slightly less harp, hence more realistic, both show Beecham at his swaggering best anyway. In the 'Manon Lescaut' Intermezzo, Sir Thomas is indeed magnificent with typical interpretative touches that really bring the beauty of this music to the fore. Mozart was also a Beecham specialty as this lovely account of 'La Clemenza di Tito' demonstrates. Tchaikovsky was not a typical Beecham staple but there is enough energy and charm in the waltz and Polonaise from Eugene Onegin to pass muster! Finally there is some thrilling Wagner, a scintillatingly beautiful Third Act Prélude from Tannhäuser and a triumphantly bombast-free 'Rhinegold' Finale, both unissued until now and essential items of the Beecham catalogue. The participation of the great Paul Schoeffler in the latter piece also adds to the importance of this release. Informative and highly readable notes by Graham Melville-Mason add to the allure of this splendid operatic album.